If you’ve never come across the term ‘freakshake’ before, they’re mega milkshakes with lots and lots of sugar, fat and calories. It’s a trend that started in Australia and recently found it’s way to the UK. A freakshake is basically a regular milkshake with added extras like chocolate, chocolate sauce, caramel, whipped cream, all topped off with a brownie, cheesecake or a doughnut. A mashup of drink and dessert. Because a milkshake or a brownie alone is never enough 😛 You’ll either think this sounds like the best thing ever invented or your worst nightmare! I must admit I’ve never tried one nor will I ever order a ‘proper’ freakshake. Packed with full fat milk, God knows how much sugar and drowning in saturated fat. As a nutrition student, this to me is one of the worst inventions ever! It’s not like we need anything else to contribute towards our society’s ever growing obesity crisis and rising chronic disease rates. Instead, I have come up with my own, much healthier version. 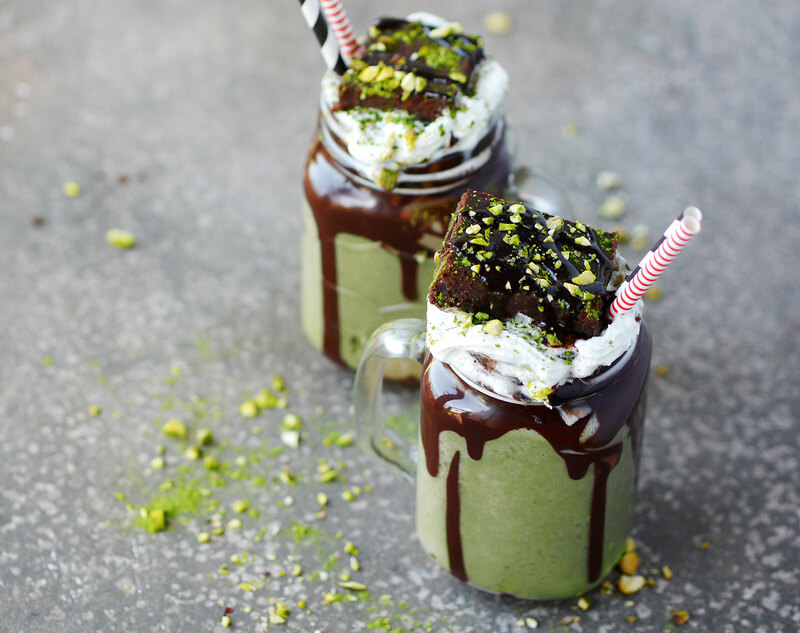 Let me introduce you to my healthified vegan matcha freakshake. Like a regular freakshake, only much lower in fat, calories, sugar and completely vegan! With added PureChimp matcha green tea powder to make it pack with antioxidants. Made using frozen bananas packed with vitamin B6, Manganese, Potassium, Vitamin C and fibre without any of the saturated fat. I also added cashew butter to make it extra creamy and sweetened it with some maple syrup, but of course if you’re concerned about the sugar content you would always cut it out or use a zero calorie sweetener instead. Freakshakes are said to contain a whopping 2000 calories per serving – that’s the daily recommended intake of calories in one treat! That shouldn’t even be allowed! My version comes at just over 500 calories per serving including the vegan cream and homemade brownie. It’s still a lot, but can be enjoyed as a treat since the ingredients are good for you. You could always leave out the brownie and cream and enjoy it as a milkshake. I’ve included the nutritional information at the bottom with and without the brownie. 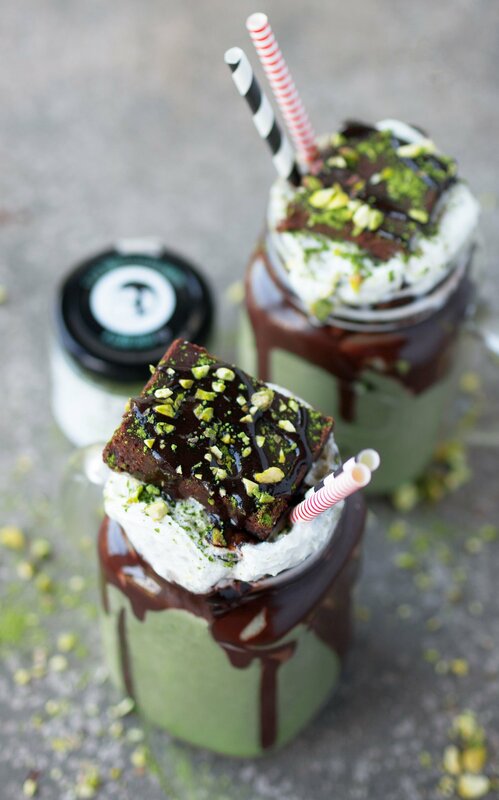 This healthified vegan matcha freakshake would make an amazing New Year’s Eve treat for this weekend, or a delicious healthy breakfast on New Year’s day – perhaps without the brownie though. WATCH THE VIDEO AT THE TOP OF THE PAGE FOR INSTRUCTIONS. Never heard of a freakshake but o my goodness, this looks incredible!!! xoxoxoxo It is like -500 degrees right now, but I don’t care! I need this! I’m with you – I shudder a bit at the idea of a “proper” freakshake but oh my word yours looks amazing! Proof that anything can be made healthier ;p I was actually drooling over this on Pinterest yesterday and will have to give it a try sometime. Like you though, I won’t be having a typical one any time soon! 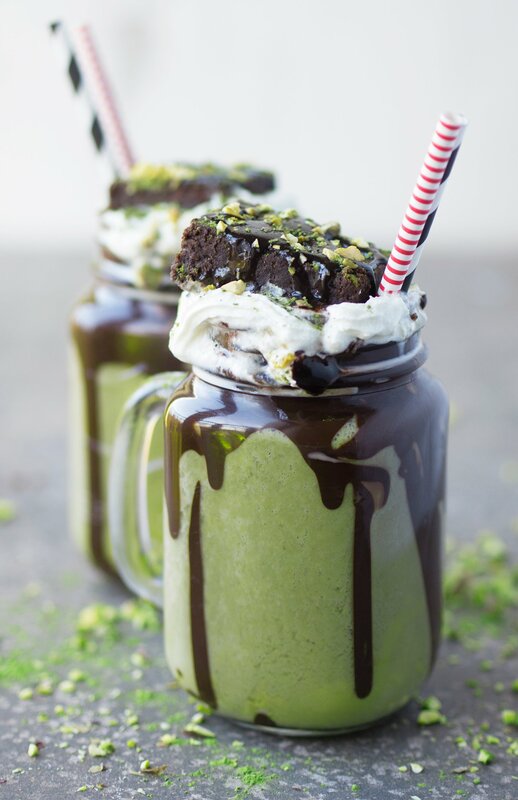 I am drooling at this shake, I just can’t take my eyes off it. It sounds amazing. Wow, I’ve never had a freakshake before (not likely given interest in healthy things) so its great you’ve tried to make a healthier version. If I ever get a freakshake craving I’ll know where to come for inspiration! Wowzer… these look incredible! So visually appealing and I bet they taste amazing too.